As a result of its apparent ugliness, Taha's striking housing block in Clerkenwell is already under threat of demolition. Meanwhile Moore's house has been named one of the worst new buildings in the UK. There is no denying that both buildings stand out from those around them. They are different and, to some who should know better, this is a problem. 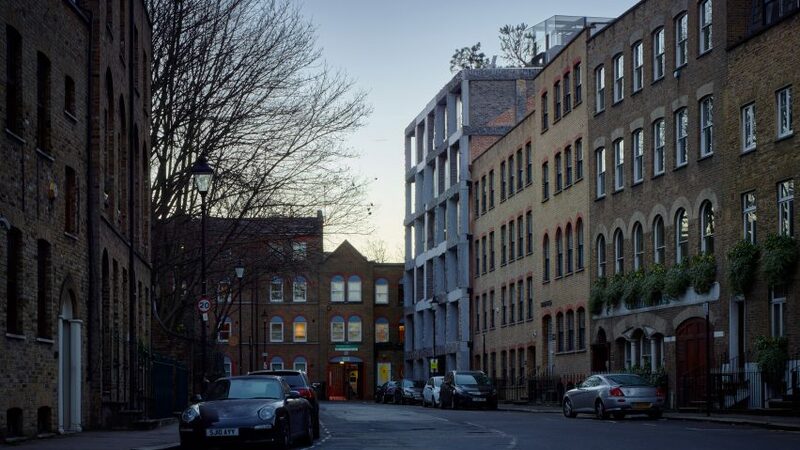 The rough stone – some of it straight from the quarry – of 15 Clerkenwell Close is in stark contrast to the faux historic brickwork of the building's neighbours, while the bright orange bricks of Moore's house make it jump out from its suburban south London street. But for those that have bothered to look beyond the buildings' looks, it is clear that both have merit as architecture. Taha's 15 Clerkenwell Close has already won an RIBA National Award – perhaps the UK's most vigorously judged architecture awards – and made the shortlist for the inaugural Dezeen Awards, ahead of tough competition from all around the world. Among its most vocal critics is Ann Pembroke of the local Clerkenwell Green Preservation Society, who said she was "appalled" by the building as it "stands out like a sore thumb". Another who has taken issue is the head of the planning committee at Islington Council, who in 2017 told a local paper that "the building is awful". "Design is a matter of taste," said the councillor, "but I've not met anyone who has said it's an appropriate design next to a Grade I-listed church." But good design is not a matter of taste. Aesthetics may be a matter of taste, but high-quality architecture should be judged on much more than a first glance. Just because a building looks ugly, which of course is subjective, it doesn't make it a bad building. Taha believes that the councillor's personal dislike of his building, which is also his home, is the reason he has been served two orders to demolish it. "I don't mind aesthetic criticism at all, its fun to debate, but when its being used as part of an agenda to justify and soften the mistaken enforcement notice and gloss over ignorance it isn't anything to do with aesthetics anymore," he said. The criticism levelled at 15 Clerkenwell Close is basically that it is not a brick building. This shows the sad state of architecture thinking by some in positions of responsibility. Those that take the time to investigate the building in detail will appreciate the inventiveness of the design and the impressiveness in the engineering of that structural stone facade, whatever their views of its appearance. For architecture to progress, innovation must be encouraged not punished. Innovation was also at the heart of Moore's visually distinctive house. Designed to meet the strict sustainability standards set out by Passivhaus, the house is equipped with a range of impressive features, from automated louvres that remotely open and close to regulate the internal temperature, to an array of solar panels and hot-water heating panels. But the building has been singled out for attacks based entirely on its appearance. It was shortlisted for this year's Carbuncle Cup, the arbitrator of bad British architecture. This makes it, according to architecture website BD, one of the six worst new buildings in the UK. "With its garish colours, unremitting red brickwork, louvered windows and blockish design behind a solid six foot wall the house is a clumsy and alien blot on the streetscape," reads a quote from the person who anonymously nominated the building for the award. "To add to the ugliness solar panels, not normally allowed in the conservation area, have been permitted." This personal criticism does not go beyond the facade. The house's red/orange bricks relate to the existing brickwork used on the street, while the house's form is largely due to the cramped, overlooked nature of the site, and the louvered windows are part of a well-thought out environmental strategy. This building should be applauded for making the best of an uninspiring infill site – adding a house in a city that desperately needs more housing. The fact that the brick colour gives the house, in BD's words, the "appearance of a red-faced child who has said something gauche in a room full of grownups" is not a valid justification to shame it on a national level. As Charles Holland put it on Twitter "who gives a f*** if the architect likes orange drain pipes." In this case, the Carbuncle Cup needs to be more rigorous in its criticism. The public shaming of these two buildings highlights a growing tendency to judge buildings on appearance alone – a tendency that is easily fuelled by the way criticism increasingly plays out via social media. Aesthetic criticism is important, and of course how a building functions within its environment will impact its success, but this is only one aspect of quality design. Criticism of architecture must be taken seriously, by magazines and those in local communities with positions of responsibility. Those with loud voices must seriously consider what they say about buildings. Although both unusual, Taha's 15 Clerkenwell Close and Moore's Passivhaus are both well-considered projects, and should be judged as such.